Chocwasabi is based on the foundation of a basic snack item or tasty treat combined with the eclectic mixture of chocolate & the hot, exotic taste of wasabi. 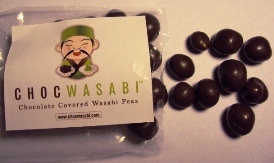 The first offering in our line of exciting new items is the chocolate covered wasabi pea. I received a package of these chocolate covered wasabi peas in my March Love with Food box. For these yummy morsels, I recommend something light and refreshing, and because the heat does build, you want something that will cool the palate too. I chose a white tea, specifically, this Organic Silver Needle tea from Nature’s Tea Leaf. A perfect choice! Because the flavors were delicate, it didn’t interrupt the unique flavors in these amazing little treats! A delightful tea time snack! I was not sure what to expect with these. I am not a fan of peas. That is to say that they are probably the one vegetable that I DO NOT like. And … I can’t even say that with complete confidence, because it’s been years since I’ve actually had peas with the exception of a few peas floating around in a soup or stirred into a stir-fry. And I didn’t mind the peas in the soups, stews and stir-fries that I’ve had them in. And for all I know, I might actually like peas now – after all, our taste buds do change every so often. But, I’ve never had confidence enough to actually try wasabi peas. I don’t like peas, and while I do like wasabi when it’s stirred into something like a ranch dipping sauce (this is awesome when served with french fried green beans), I don’t have a whole lot of experience with wasabi outside of that spicy take on a dipping sauce. But, these are CHOCOLATE wasabi peas and I have plenty of experience with chocolate … and most of that experience is positive. I can’t really think of anything that I didn’t like that was chocolate. I’m sure that there have been occasions when I’ve disliked something chocolate, but nothing really comes to mind at the moment. So I decided to give ’em a try. And these are AWESOME! The pea doesn’t have much flavor at all … basically all I get from the pea is a dense crunch from it that is very satisfying. A bit like biting into a very crunchy peanut. The dark chocolate is sweet and smooth … and the wasabi is HOT! And I am loving the burn from these babies! The contrast between sweet and spicy is amazing, and I love the crunch. My Love with Food Box has arrived! Yeah, yeah, I’m still really behind! This is my March Love with Food box article … sorry for the delay! My March Love with Food box went on a little detour! I received the message that my box had been shipped, and I waited patiently for the expected arrival date … but when that day came and went and the box did not arrive, I figured something had delayed it, so I’d wait until the next day. The next day came and went … and another … and still no box! I started to get worried. I checked the tracking to see what the hold up might be … and it said that my box had been delivered! Huh?!? I contacted customer service and they were prompt in replying to me, and I got a replacement box delivered to me. And I’m really glad that I didn’t miss out on this box, because it’s amazing! Watch this blog for reviews on some of these tasty goodies!